PLEASE, NO invitations or self promotions, THEY WILL BE DELETED. My photos are FREE to use, just give me credit and it would be nice if you let me know, thanks.. 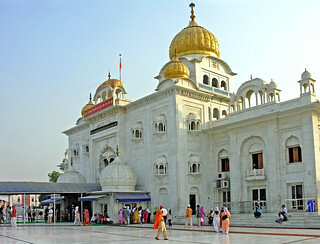 The Sikh religion began at the end of the 15th century. The Muslims clashed with Hinduism and Guru Nanak (1469-1539) saw the brutality of the Mughals. His teachings centered around equality and reconciliation between Hindus and Muslims. After making a pilgrimage to both Hindu and Muslim holy sites, he founded a new monotheistic religious community. As a mark of their devotion to Guru Nanak, his followers called themselves Sikhs, a name which means disciple. Sikh Langar is based on Sikh religious principals of Seva (Voluntary Service to Community) and Wand Ke Chakna (Share one’s food around). The principal dictums of Sikh living are "To earn one's living by honest labour"; "Remember Almighty Lord or Supreme Being - Akal Purukh" all the time and "share with others what you can - afford to give". Thus for Sikhs to serve in Langar for cooking, cleaning, distributing or donating, are fulfillment of their religious obligation. Sikhs believe in existence of "One Supreme Being" for the whole universe and also that all humans are children of the same One Supreme Being, which is formless, not subject to life and death, Omnipresent. Thus serving all humans without any inhibition on account of cast, colour, religious or financial status, is compliance of Sikh religious code.